“Bringing Human Rights Home!” has become a frequent claim in the United States in recent years. The slogan's popularity demonstrates the difficult place that human rights have in the States in the twenty-first century as a result of factors including the ongoing tensions between domestic and international law, state sovereignty and purportedly universal ethics, ideas and values. In fact, human rights have experienced a variety of American trajectories in the twentieth century with these tensions shaping the contemporary role of human rights in American culture and politics. Mark Philip Bradley’s monograph “The World Reimagined: Americans and Human Rights in the Twentieth Century” sheds new light on these trajectories, displaying how Americans perceived and negotiated human rights in the period since the Second World War. In his regional study, the historian outlines the origins and development of new American sensibilities regarding human rights, and asks how human rights were “understood by American publics and the transnational forces that shaped them” (p. 16). Based on a variety of source materials including photographs, sculptures, documentaries, films, exhibition material, books, newspapers and governmental documents, Mark Philip Bradley addresses “how human rights concerns might have resonated with their intended audiences” (p. 23), aiming to provide a transnational “bottom- and […] middle-up” perspective on American human rights imaginations and to decenter the role of the U.S. in writing human rights history (pp. 9f.). The study is part of a well-established field of scholarly research on human rights. Two strands of historical research situate the origins of human rights as a philosophical, legal and political concept in different time periods. The first strand sees human rights as part of a longer tradition, placing their origins long before the 1940s with their roots in ancient religious belief systems and/or the European Enlightenment. The second strand, prevalent in more recent studies, suggests that previous ideas informing today’s understanding of human rights were primarily developed in the 1940s and experienced their popular, transnational breakthrough in the 1970s. Mark Philip Bradley situates his study within this second strand of historical research (p. 9), stating that “the prominence of human rights language in the 1940s marks a critical moment in which an emergent global human rights imagination began to manifest itself in world and American cultural politics” (p. 17). 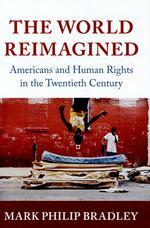 In line with the predominant historical narrative of two crucial yet nearly disconnected time periods of human rights in the twentieth century, “The World Reimagined” is subdivided into two sections focusing on American human rights trajectories in the 1940s and the 1970s respectively, with only “few causal lines” (p. 17) between both timeframes. The monograph's first section, “The 1940s” (pp. 19–127), addresses what Mark Philip Bradley calls a “new believability” of human rights in the 1940s in the U.S. by looking at the “everyday on-the-ground-efforts” of Americans in the making of a new global human rights politics in the immediate post-war period (p. 17). Emphasizing the role of visual information provided through photographs in newspapers, reportage and photojournalism, the author demonstrates how Americans could “mass witness” the “social suffering” of the Depression era of the 1920s and 1930s, as well as German atrocities under the Nazi regime (pp. 25, 75). This new visual culture led to a growing American “conscience for the suffering” (pp. 80f.) and increased the perceived need to defend individual rights. The UN charter offered new ways for African, Japanese and Native Americans “to understand and demand […] respect for human rights as American citizens” (pp. 89, 94), using “a transnational frame to approach a variety of instances of domestic racial discrimination” (p. 94). As the author highlights, these judicial “global rights cases” brought to American courts were part of “internationalist sentiments” relating to “human rights […], multilateralism, global justice, international policing, and humanitarian intervention” (p. 95) which were continuously in tension with questions of state and national sovereignty (pp. 95, 103, 108ff.). This was particularly the case when human rights vernaculars challenged the Jim Crow segregation of the post-war period. In this context, the Bricker Amendment of 1952–1953 and the policies of the Eisenhower administration “marked a shutting down of the liminal space in which the 1940s global human rights imagination had flourished in the United States […], forcing what would become an almost two-decade-long official U.S. aversion to human rights politics” (p. 113). However, the 1970s, covered in the monograph's second section (pp. 123–225), saw human rights experience a popular global breakthrough which could not have been foreseen in the previous two decades. If Americans had helped to bring human rights into the world in the 1940s, the American human rights moment of the 1970s was based on “the importation of transnational ideas and practices into domestic space from the bottom up rather than the top down” (p. 125). Global social mobilizations, the transnational use of new technologies and media, new patterns of international migration, the end of decolonization processes and the intensification of global capitalism challenged the nation-state-based international order of the Cold War, giving way to a novel transnational human rights advocacy (p. 131f.). Coinciding with new concerns about humanitarianism, feminism, the environment, and apartheid (p. 130), “a new global human rights imagination emerged within new structures of feeling that, in privileging witness and the experiential, began to remake prevailing notions of power and authority” (p. 155). In the U.S., the transnational rise of moral witness and testimonial truth of torture, political murder and state imprisonment in Latin America, the Soviet Union and in Eastern Europe became entangled with growing individualist sentiments at home (pp. 179, 196) and gave human rights a new relevance. A new generation of human rights activists, among them many professionals such as lawyers, ecologists, or doctors (pp. 208ff. ), provided novel ways to produce and circulate expert knowledge via transnational advocacy groups and organizations such as Amnesty International or Médecins sans frontières (pp. 144ff.). Mark Philip Bradley concludes that the “contemporary believability in human rights” as well as their “enduring limits” (p. 201), were rooted in the human rights imaginations of the 1970s which were then crucial “for the growing belief in human rights as a universal moral language” (p. 200). The link which Mark Philip Bradley establishes between the feeling “to have rights or to lose them […]” and “the growing believability of the global human rights imagination and its American vernaculars” (p. 8) is an interesting if complicated one. Firstly, it does not conceptualize the emotional and experiential level of human rights which the author argues as crucial to describe the “shifts in global effect and feeling for the making of human rights history” (p. 8). Secondly, “these American sensibilities” and their “global roots” (p. 9) referred to broader, mostly Western ideas of humanness and humanity which, as the author admits himself throughout his study, may or may not have shaped American human rights vernaculars, and were thus not necessarily entangled with (trans-)local or global human rights imaginations. Overall, Mark Philip Bradley provides a progressive yet not uncritical perspective on American human rights imaginations, related sensibilities and vernaculars, and their global entanglements in the twentieth century. He points to some major inequalities and struggles which took place within the American (and global) human rights discourse including the “unwillingness to address the question of race in the American context” (p. 61) since the 1940s, the continuous dominance of whiteness and academic background of transnational human rights activists, as well as the marginalization of women and LGBTQ issues in human rights debates until the 1990s (pp. 62f., 221). However, the complicated relationship between public expectations and the use of human rights vernaculars as a tool of state diplomacy remain largely unaddressed. The author concludes with a pessimistic “sense of an ending” (pp. 227–240) acknowledging that “the place of the United States in the making of a global human rights order […] has further diminished in the twenty-first century” (p. 228). Human rights abuses at home and abroad conducted in the context of the “war on terror” after 9/11 as well as increasing economic, social and racial inequalities and discrimination at home (p. 231) have both reduced and complicated American believability in human rights in the last 15 years. “The World Reimagined” is a valuable guide to understand both why and the extent to which human rights were deeply embedded in American culture and politics at some moments more than others in the twentieth and twenty-first century. In times where the far right, new conservatism as well as neoliberal and discriminatory policies and rhetoric of the Trump administration are challenging American values and rights imaginations, the slogan “Bringing Human Rights Home” might gain a new domestic relevance for Americans. As Mark Philip Bradley himself states, “the human rights moments of the 1940s and 1970s […] offer a set of vocabularies and practices that can mobilize Americans to make human rights their own” (p. 237). See for instance Amnesty International’s new mission to bring human rights home to the U.S. in recent years with the “Bringing Human Rights Home” concert at Barclays Center in Brooklyn, New York City, on 5 February 2014. After the shooting of Michael Brown in Ferguson, Amnesty International USA became also involved in the fight for black civil rights. Krissah Thompson at the Washington Post titled her article accordingly “A New Mission for Amnesty International: Bringing Human Rights Home,” 21 October 2014, https://www.washingtonpost.com/lifestyle/style/a-new-mission-for-amnesty-international-bringing-human-rights-home/2014/10/21/8e457b1d-bf46-4887-9fe1-33c36bac7fb5_story.html?utm_term=.316fde215947 (21.08.2017). Moreover, Tarah Demant, senior director of the Identity and Discrimination Unit at Amnesty International USA published an article at the American Bar Association’s Magazine to tackle the necessity of “The Effort to Bring Human Rights Home,” Human Rights Home Magazine, Vol. 42 (2015) 2, https://www.americanbar.org/publications/human_rights_magazine_home/2015--vol--41-/vol--41--no--2---human-rights-at-home/the-effort-to-bring-human-rights-home.html (25.08.2017). Lynn Hunt, Inventing Human Rights. A History, New York, 2007; Micheline Ishay, The History of Human Rights. From Ancient Times to the Globalization Era, 2nd ed., Berkeley 2008 (2004); Nick Spencer, The Evolution of the West. How Christianity Has Shaped Our Values, London 2016. Elizabeth Borgwardt, A New Deal for the World: America’s Vision for Human Rights, Cambridge, MA 2005; Jan Eckel, Die Ambivalenz des Guten. Menschenrechte in der Internationalen Politik seit den 1940ern, 2nd ed., Göttingen 2015 (2014); Stefan-Ludwig Hoffmann (ed. ), Human Rights in the Twentieth Century, Cambridge, MA 2010; Samuel Moyn, The Last Utopia. Human Rights in History. Cambridge, MA 2010. Barbara Keys, Reclaiming American Virtue. The Human Rights Revolution of the 1970s, Cambridge, MA 2014. For instance, see: Eckel, Die Ambivalenz des Guten; Moyn, The Last Utopia; an exception to this narrative are the studies of Roland Burke and Fabian Klose which emphasize the (dis-)connections between human rights and decolonization processes: Roland Burke, Decolonization and the Evolution of International Human Rights, Philadelphia 2010; Fabian Klose, Menschenrechte im Schatten kolonialer Gewalt: Die Dekolonisierungskriege in Kenia und Algerien 1945–1962, München 2009. This title is a reference to Julian Barnes’ novel “The Sense of an Ending.” Julian Barnes, The Sense of an Ending, London 2011. Annette Karpp: Rezension zu: Bradley, Mark Philip: The World Reimagined. Americans and Human Rights in the Twentieth Century. Cambridge 2016 , in: H-Soz-Kult, 09.11.2017, <www.hsozkult.de/publicationreview/id/rezbuecher-26919>.